Where Can I Find Career Information? Every other year, the United States Department of Labor publishes the Occupational Outlook Handbook (OOH). This useful guide describes types of careers, specific jobs, and information about the training needed for these jobs. 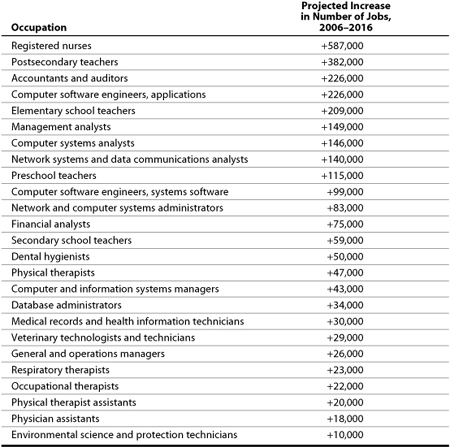 It also lists jobs that are expected to be the most in demand in coming years. JIST, the publisher of The Kids’ College Almanac, also publishes the OOH, as well as a useful resource called Young Person’s Occupational Outlook Handbook, which is easy to read and describes about 270 jobs. Some job titles even change their meaning over time. Today, a network administrator can mean someone who manages a group of broadcast stations; but it can also mean someone who manages a company’s computer systems. The Department of Labor’s home page on the Internet provides links to a lot of useful information about careers. Its Web address is www.dol.gov. The department also has a Web page with links for kids. Its address is www.bls.gov/k12/. Every year, new jobs are created. In the 1980s and early 1990s you would not have studied Web design (the creation of pages for the World Wide Web) because the Web itself did not exist. Similarly, e-commerce, the use of the Internet for buying and selling products and services, is continuing to create new jobs that never existed before. How Will Education Affect My Earnings? Your education is likely to affect your future income. The more education you have, the higher your earnings are likely to be, not only in any one year, but over your entire lifetime. Income is an important consideration when you make career and academic decisions. However, it should not be the only consideration. Quality of life, job satisfaction, work hours, job stability, where you will be able to live, and many other factors are also important to consider. Whatever occupation you choose, if you become a lifelong learner, you will increase your earning potential and have more choices and flexibility about how you will make a living. The following chart shows how your education level can affect your income. Source: Bureau of Labor Statistics (2008).